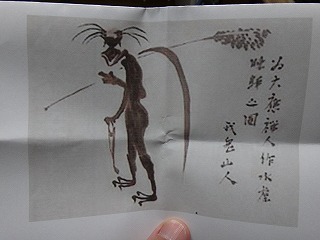 “Kappa” is a kind of legendary creature, a type of water sprite found in Japanese folklore. A number of stories about Kappa have been told across the nation since early times. Kappa are typically depicted as roughly humanoid in form, and about the size of a child. Their scaly, reptilian skin ranges in color from green to yellow or blue. Although their appearance varies from region to region, the most consistent features are a carapace, a beak for a mouth, and a plate on the top of their head that holds water which is regarded as the source of their power. This cavity must be full whenever they are away from the water; if it spills, the kappa will be unable to move or even die in some legends. Kappa supposedly inhabit the ponds and rivers of Japan and have various features to aid them in this environment, such as webbed hands and feet. 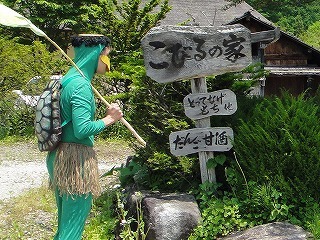 Tono city, located in Iwate prefecture Japan, is known as one of areas where have been told that the Kappa appeared in early times. There have been some folk stories about Kappa in this area, sounds unique, interesting and attractive. 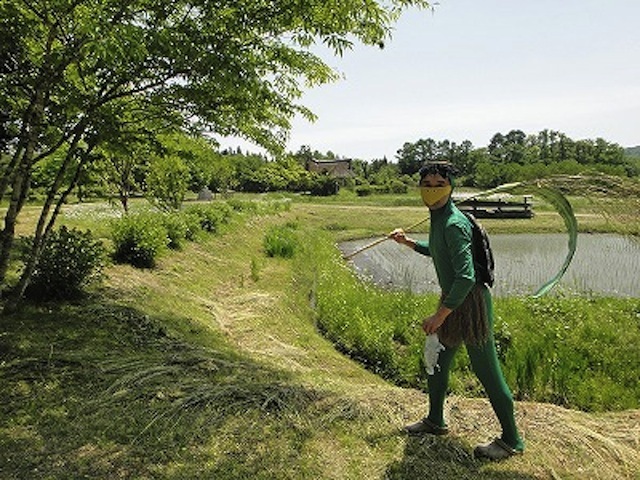 Being inspired by this, the writer of this article got an idea on his mind that he would transform himself to a Kappa and walk around this area. Is he out of mind?? But sounds funny! I would like to introduce his report for his experience of being Kappa. According to legend, Kappa has green or blue skin, a beak for a mouth, a plate on its head, and a carapace on the back. He made them himself. This is also handmade by him. 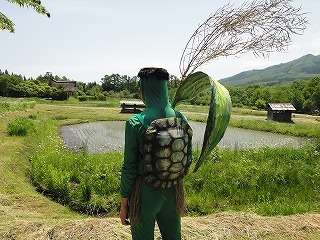 His concept was that he would be a typical one so that everyone can recognize as a Kappa easily. 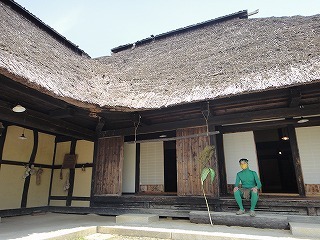 Though he bought only a green skin-tight garment, he made the other costumes by himself. 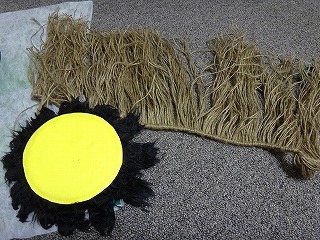 Knitted the grass skirt, and painted the carapace politely so it looks old and dirty. Does he look like Kappa? 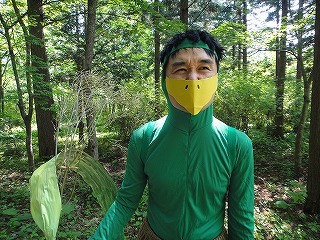 Yes, probably people can recognize him as Kappa from the distance! He did great job! 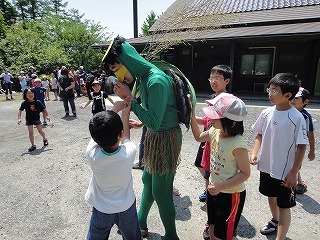 Though he is a little bit taller than the actual Kappa which is about the size of a child, let’s ignore that point. Some people were already seeing him at this parking lot. Let’s go to that building! 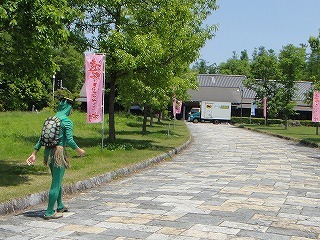 The area where have been told that Kappa appeared is behind the building over there, it’s called “Tono Furusato-mura (home village)”. He went toward the building and went inside. Inside the building was a souvenir shop. Obviously, people were looking at him from his behind. He felt it on his back, but that was exactly what he intended to. 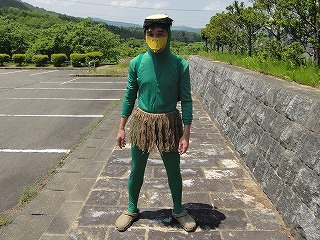 He was happy he was recognized by people as Kappa, because his effort for this disguise was well rewarded. 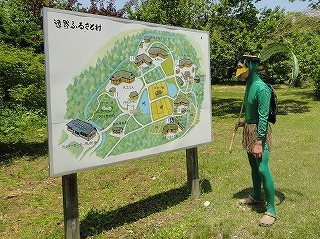 Now, let me explain his exact purpose for being Kappa in this village. 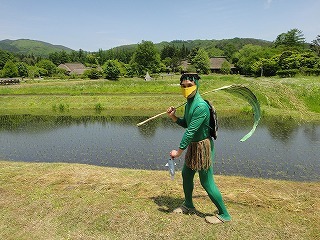 Kappa Costume Contest was being held in this village. 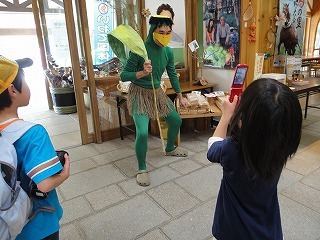 At that time, “Kappa Costume Contest” was being held there, which people can apply for with a photo taken in this village, wearing costumes such as carapace, plate on the head, and beak for mouth. He intended to join this contest, and that was his actual purpose for his trip this time. 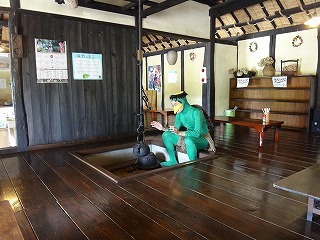 Well, he had to find a good place inside the village to take the picture for the contest. 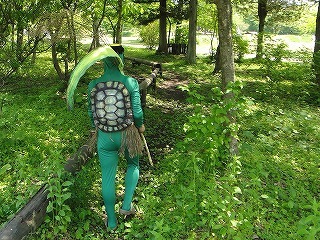 Let’s go out, and go find the best place suitable for Kappa costume! 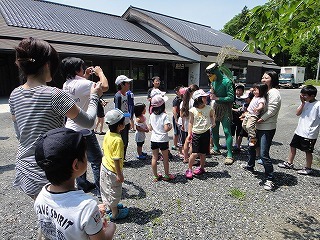 While walking around, children gathered and talked to him. Please don’t touch my back…. Parents were taking photos. 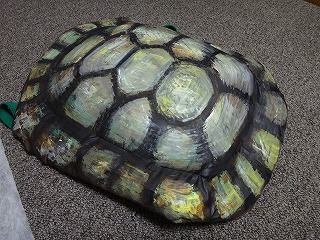 The carapace for turtles is usually really hard, but his carapace was really soft because it was made of cardboard and sponge. 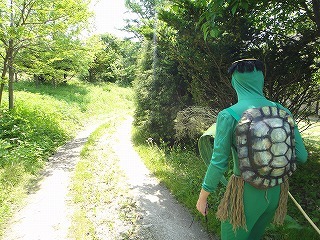 Young Kappa has soft carapace, is it true? No, I don’t think so…. 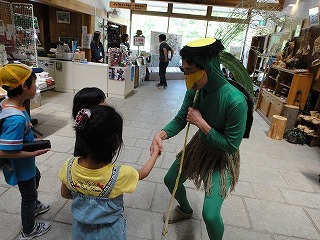 Anyway, he answered softly to the child, and ran away really fast so the child couldn’t catch up. Phew, now I’m alone. Where is the best place? This village was so quiet and beautiful nice place. It does make sense that the water deity lived here and appeared sometimes. This is the best pose he imaged. Walking around on the grass, looking for some fish or food alone. 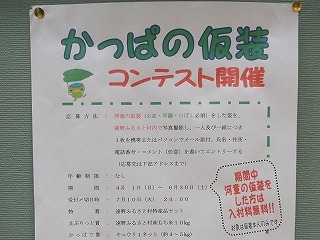 This is the Kappa’s image. He would like to find the place where he can create a similar image to this picture. 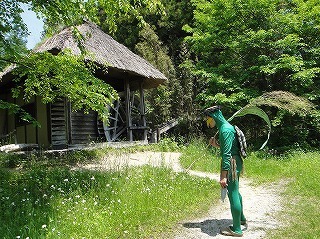 He walked around the village and looked for the nice place for a while, but he couldn’t. Umm…. let’s walk a little bit more. Does it fit? Umm… I don’t think so…. How about this? It looks better, doesn’t it? It’s getting much better than before, but let’s go around a little bit more. On the way, he found a cafe with a relaxed atmosphere. He was getting thirsty, and the plate on the head had no water. According to legend, Kappa will be unable to move or even die if the plate has no water. Immediately, he went into the cafe to get some water. It’s said they have dumplings and sweet sake. Do you think it’s good picture? It’s hot out there though. 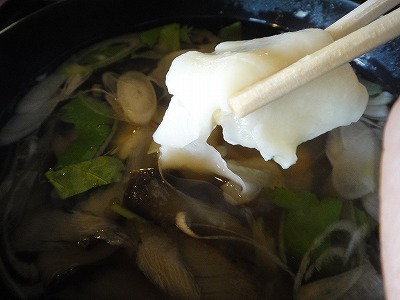 It’s called “Hittsumi”, a kind of soup with dumplings and vegetables. 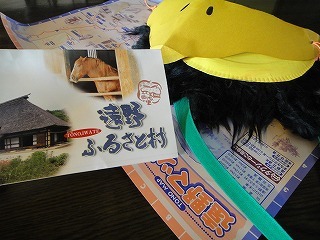 It was really tasty, but it was difficult to eat because of the beak. He turned back to a human just for a while, and enjoyed the local dish. Taking a break there and getting some water, he got some energy again. Completely recovered. Taking some photos with human beings…. He walked more and more to find the best place for picture. He’ve got headache because of the plate on the head. It’s almost. It needs trees and its shadows on the picture. His head was getting sore because the plate on the head was tightening it. The picture was getting better than before, on the other hand. Finally he found the best place. Finally he found his best place, and took this picture. 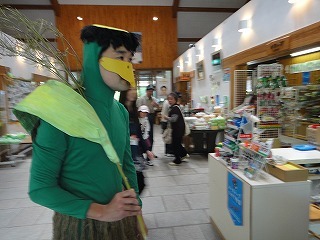 With the tree and its shadow near the pond, the atmosphere of Kappa place has been created well. It’s similar to this picture, isn’t it? 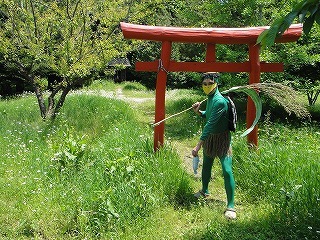 He decided to apply for the contest with this photo, then his mission has been completed. 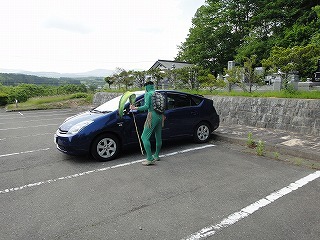 After taking some photos and shaking hands with some children, he turned back to a human, then he went toward his home by car. Now we have seen his challenge to be a Kappa. What do you think? 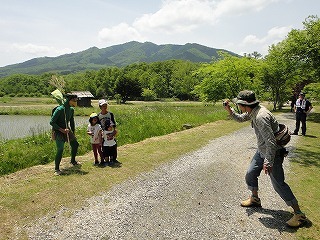 It was really funny appearance, but the last picture he took creates the good atmosphere of Kappa’s place, I think. I would like to thank him for his effort, and I hope he would win on the contest.